The Commentary on the Book of Psalms 61-80 with Midrash Tehillim, Volume 4. The hermeneutic approach for interpreting the Psalms is from a Torah perspective examining the theological, historical, moral, and spiritual perspectives. 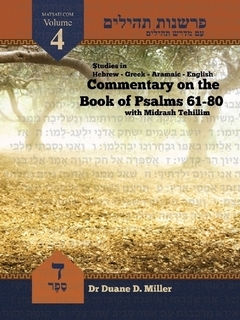 This unique commentary is a verse by verse exposition on the Psalms and the rabbinic commentary. Every chapter of the Book of Psalms is treated as a separate chapter in this book. Each chapter is composed of two major divisions: (i) examining and comparing the original Hebrew (Masoretic Text), Aramaic (Targum Pseudo Jonathan), and Greek (Septuagint) translations of the Psalms for a greater understanding of the words of David and (ii) studying Midrash Tehillim, the Rabbinic commentary on the Psalms. Is our understanding of God consistent with how David understood God and His promises? We also will be looking at parallels in the Rabbinic commentary to New Testament thought. Knowledge of Hebrew, Aramaic, and Greek are not necessary to read this book. Previous articleTehillim / Psalms 81, Part 2, Is it enough to merely ask the Lord God to save us? Next articleBits of Torah Truths, Parashat Vayigash, What is Your Spiritual Condition?